It feels like it’s been too long with the relentless movie-bashing and online trolling against the newest Marvel Cinematic Universe movie “Captain Marvel.” From fake movie reviews posted on sites like Rotten Tomatoes from people who hadn’t even seen the movie – causing Rotten Tomatoes to remove its “Want to See” feature after people had affected the anticipation ranking of “Captain Marvel” on its site so much – to other online abuse on Twitter and social media, “Captain Marvel” came out like an underdog in a race that had started without her. Now that “Captain Marvel” is finally out, it’s clear. “Captain Marvel” crushed it. The competition. The expectations. The negative reviewing-bombing. The online trolls. It crushed it all. “Captain Marvel” is fun, visually stunning, and packed with action and emotion, hitting viewers with hard-hitting twists, questions of loyalty, and moments of triumph. “Captain Marvel” is the origin story for Carol Danvers (Brie Larson), and is set in 1995, also featuring S.H.I.E.L.D. agents Nick Fury (Samuel L. Jackson) without his signature eye patch along with Agent Phil Coulson (Clark Gregg), who is just a rookie at this point in S.H.I.E.L.D. “Captain Marvel” begins with Brie Larson as Vers on the planet Hala, the capital of the Kree empire, as she trains to be a part of the Kree Starforce, on their way to battle more Skrulls — shape-shifting aliens who can take on the form of anybody whom they see — in the relentless Kree-Skrull war. She also has amnesia, not remembering anything past six years ago when she woke up on Hala. The amnesia feels like a callback to many of the earlier comics that this character appeared in as her character has dealt with a number of mind-altering and memory loss storylines. The only complaint that I really have about “Captain Marvel” is how it is a little difficult at first to follow the plot at the very beginning,” but I feel like that also kind of emulates how Vers may be feeling only remembering the last six years of life while still trying to give meaning to her life by serving as a Starforce soldier. The amnesia storyline eventually evolves into an intricate story of self-discovery and questions of loyalty for Brie Larson’s character, and I’ve never seen amnesia be done this well in any other story or movie plot. 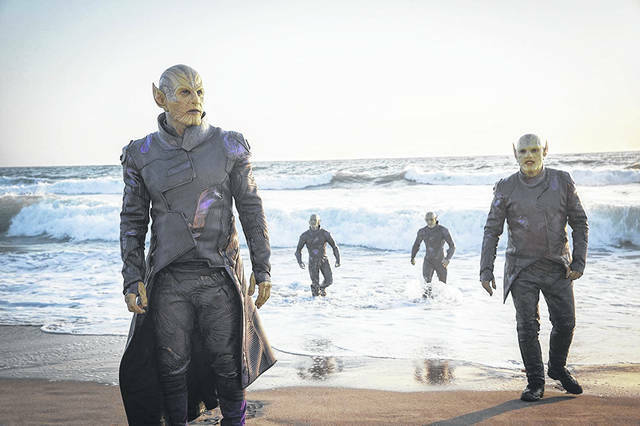 While on a mission to get a stranded Kree spy (a storyline that kind of gets abandoned), Vers gets abducted by Skrulls, who then invade her mind. This turns into an unique tool to show viewers – and Brie Larson’s character – flashbacks and more about her past that is hidden in her mind. From there, Vers and the Skrulls end up on Earth, where Vers tries to stop the Skrulls on their mission to find something on Earth – something that is tied in with her own past, which she also slowly uncovers. 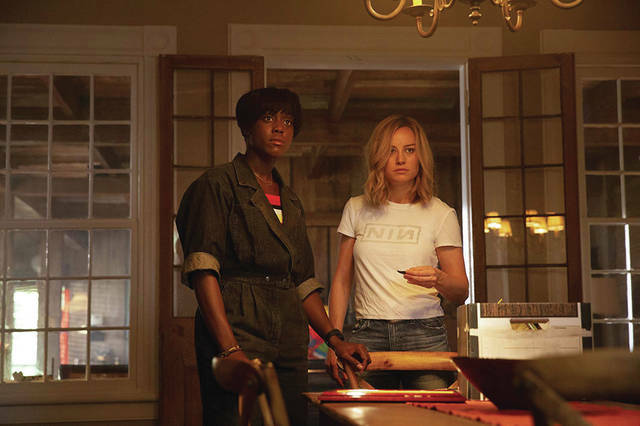 “Captain Marvel” is expertly paced between scenes of action between the different alien fights, scenes of intrigue into the investigation into what the Skrulls are looking for on Earth and who Vers really is, moments of sass because Vers is snarky and clever and doesn’t take anyone’s nonsense, and moments of so much emotion, particularly following when Vers really starts to dive into her past and finds out her identity as Carol Danvers. This is probably the most emotionally-packed superhero movie I’ve seen (possibly even including “Avengers: Infinity War” when Thanos snaps his fingers and dusts half of humanity, and definitely including all of D.C. Comics’ attempts at misanthropic superheroes). Carol Danver’s friend Maria Rambeau (Lashana Lynch) is part of what drives so much of that emotion. Lashana Lynch is absolutely amazing in this role, particularly in a scene she has alone with Carol Danvers after they reunite. She perfectly hits the viewers with the emotional pain that Maria dealt with in the past six years, and that scene is one of my favorite moments in this movie. Without giving away too much of the story, there is also a striking twist in the movie that got me, both in terms of a surprise as well as twist that made me question what the movie had first portrayed as right and wrong. It’s a twist that goes into the gray areas of an unrelenting war, and it makes viewers question who the real villains and heroes are in this movie. Brie Larson is also awesome in her role and has nothing to prove to internet critics. Larson portrayed Carol Danvers with snark and wit (particularly when she and Samuel L. Jackson’s character Nick Fury are playing off of each other in their scenes together), with subtle smirks intermixed with toughness and strength (like when she goes head-to-head in fights with the different aliens), and with vulnerability and pain (like when she finds Maria and learns about her past). Samuel L. Jackson as Nick Fury is also a major treat in this movie. Jackson is great as Fury (as per usual), who is entertaining in his investigation into Danvers’ appearance on Earth as well as the Skrulls, whose existence he doubts until he runs into them himself. Fury and Danvers’ interactions are my favorite with the way they play off of each other with their individual wit and stubbornness, forming a unique alliance or friendship as they continue to investigate the Skrull invasion. It’s also interesting to watch Fury earlier in his career, when he still has both his eyes and he’s not the boss man who seems to know all the answers. This time around, Danvers is the expert, and Fury is along for the ride to see this situation through. Danvers also doesn’t really smile — she smirks — and I love that about this character. Her hero moment — the moment where she realizes her power — gave me chills, calling back to moments in her life where she was told that she was going to fast, she wouldn’t be able to accomplish something, or she was being too emotional. It was a cathartic moment of realization that everyone who told her she couldn’t do something or that she was being too emotional was just trying to manipulate her or hold her back. And then she lets loose. In some of the more recent comics with renditions of Carol Danvers as Captain Marvel, Danvers has the power of a star, and that’s the kind of power that I picture her having in the last few scenes of the movie. Those scenes are also visually captivating as she glows and fights off not only alien soldiers, but their advanced weaponry.